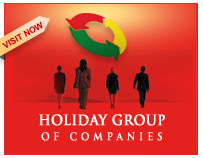 Holiday group is one of the fastest growing and ever expanding companies with a large number of job openings all through the year. We currently have a team of professionals who are experts in their fields, be it marketing or engineering. Our employees are highly skilled and dedicated as they are handpicked by our expert selection committee. They work extremely well with cent percent commitment towards the company’s success and they are our partners who stay with us during our leaps and bounds. Employee welfare programs in our company are above standards and we make it a point that their grievances are addressed in every possible manner.